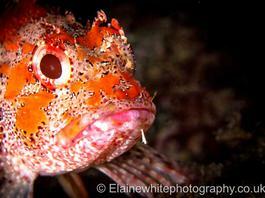 This is a shore dive from a quiet little fishing port on the South Coast approximate 6 Km past Lajes. A pleasant dive to 20m where we first visit the lighthouse, which fell into the Atlantic during a violent storm. Sat on a sloping bank from 10m down to 20m where the lighthouse rests on a flat bottom. After discovering the lighthouse we head South out past the breakwater to the Atlantic where a reef runs south the top of the reef is approximatlye 10m and the bottom of the reef gently slopes away to 30m. 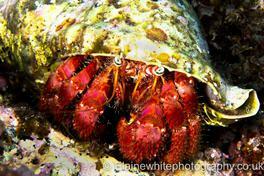 We swim along the reef at 15m as this is where the majority of the marine life is found. We always meet up with the resident common ray. Facilities at the port are plentiful with a traditional bar; shower and toilets are also within the port. This has to be one of my favourite shore dives. Another quiet fishing port on the south coast and is at the eastern tip of Pico. A gentle shelf down to 15m to the reef which then takes us down to 25m where we find the swim through arch which is home to “Black Coral”. We swim through the arch and wait for the Atlantic Big Fish to arrive. On this dive you can encounter anything from Manta rays to tuna, it’s a lucky dip of the Atlantic. We then slowly return north to the rocks east of the harbour where the smaller marine life takes shelter in 6m, this is where we can take our safety stops. There are plenty of facilities at the port, it is an ideal area to have a traditional lunch and coffee whilst taking in the views. This has to be one of the best dive of the Azores. Princess Alice Bank, or Banco Princesa Alice as it is called in Portuguese, is a submerged seamount that is located 50 nautical miles (92.6 km) to the southwest of Pico Island in the Azores. The bank has a minimum depth of 35 m (114.8 ft), located in its western zone. With clear waters that allow the observation of the ocean floor from the surface and an enormous biodiversity, the Bank, in addition to being an excellent fishing spot, is one of the important diving spots of the Atlantic Ocean. A visit by the mobular rays is a given, and enen the chance of sightings of hammerhead sharks. A MUST!!!! For those divers that need a wreck in thier package. This working pontoon sits on a sandy seabed at 24m making it accessable for most divers. The pontoon is very much intact at 25m long and almost 7m wide it is possible to enter the wreck for those qualified if not the outside plays host to many fitting which make home to lots of our marine life a normal gathering for our barracuda. A firm favourite with everybody who has done this dive before, a beautiful swim through leads us into an underwater volcano, you may also get the chance to be met by the very special sight of the stingrays. 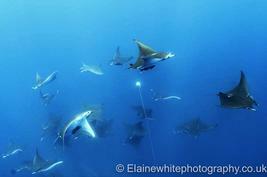 The dive site is a breeding ground for the ray. Around the dive site we will find stingrays, sea bream, parrotfish damselfish, and our ever friendly trigger fish. Within the cracks of the lava you will find Moray eels and also Mediterranean eels making home with each other. Don't forget to bring your camera!! 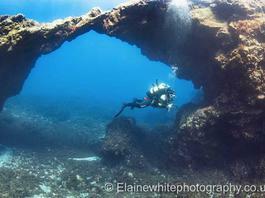 The dive site of ‘Arcos do Pico’ is located on the west coast of Pico, situated 100m off shore in front of Pocinho Bay. It's of mainly geological interest due to its volcanic formation, which gave origin to many majestic arches. All the area is constituted by rock, covered by the seaweed called cauda de pavão. 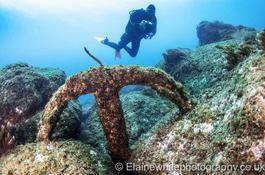 Arcos do Pico doesn't have great currents or great depths making it an ideal site for all levels of diving capabilities. 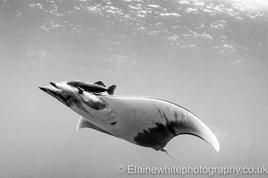 We have on numerous occasions sighted manta, mobular rays and even dolphins paying a visit to the our divers. This dive is a true dive with a different story after each dive creating great conversation on the return journey back to the port. don't just dive it,explore it. 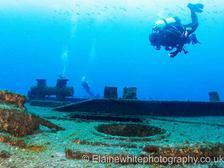 Dive the Azores offers a full array of diving to suit all qualifications and experience levels. 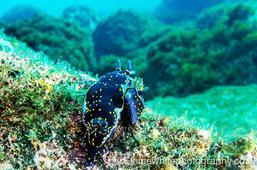 Our diving will take you around the majestic coast of Pico. Diving in Pico is possible all year round with water temperatures ranging from 17 degrees C in the winter to 24 degrees C in the summer months and visibility generally varying between 15 to 30 metres. Underwater, the seabed drops away from the coastline in a series of slopes and steps, giving divers’ easy access to the walls, caves and swim through which make up Picos underwater topography. There is abundant marine life to be found, from the small crab, octopus, slipper and spinney lobsters to the larger rays and barracudas. From June we can visit the Manta Rays out on Princess Alice and our blue and mako shark diving takes place from August to October also out on the banks. Our diving partner Twin Peaks Diving Centre is affiliated to SSI and BSAC. We offer you achievable packages that allow you to also take in the tranquil Azores and everything else they have to offer. We would suggest a 10 dive package for a weeks stay with the option to add additional dives locally in Pico, so you can choose your personal balance between diving and other available activities. Additional dives are not at a premium rate and are equal in price in proportion to that of a package. 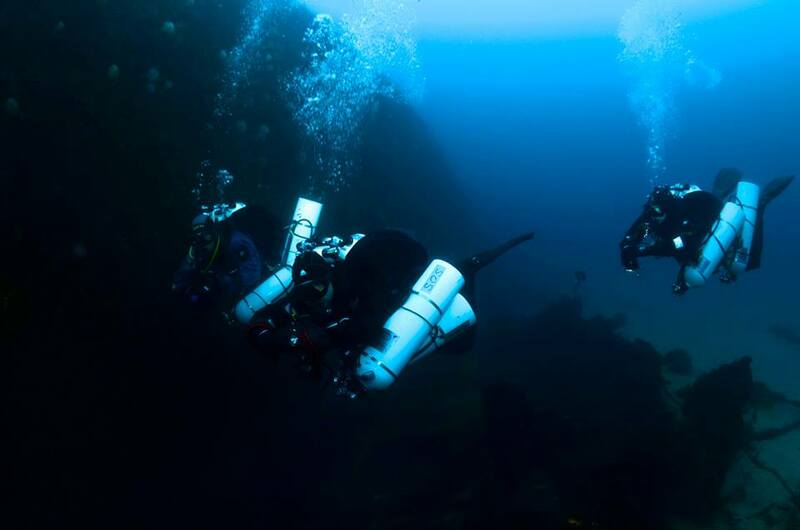 We offer packages to suit all levels from newly qualified to technical diving. 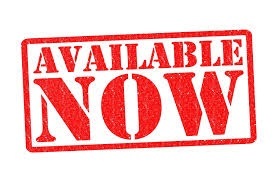 Safety is paramount and all dive packages have the option to up grade to nitrox diving for those qualified, for those who are not qualified it’s possible for you to qualify whilst with us.